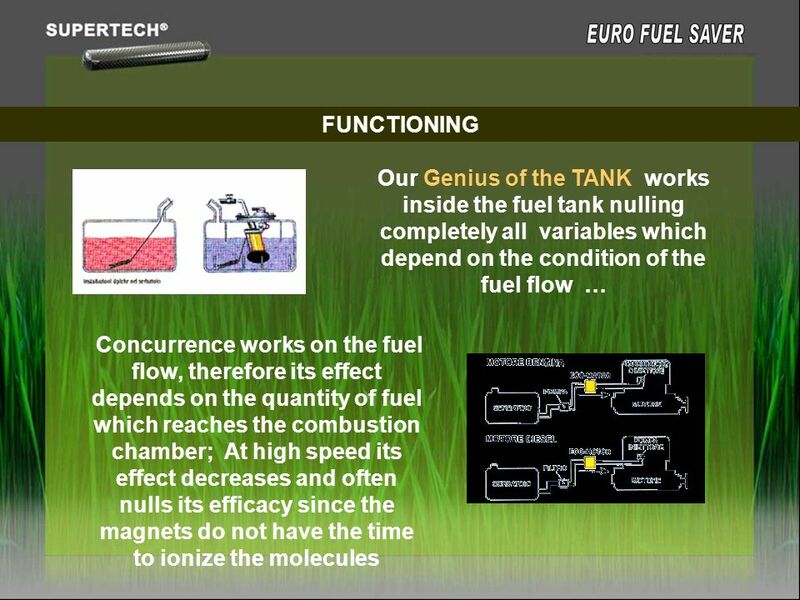 5 THE GENIUS OF THE TANK It is a solid, highly innovative device for energetic saving and for the reduction of polluting emissions from engine vehicles. 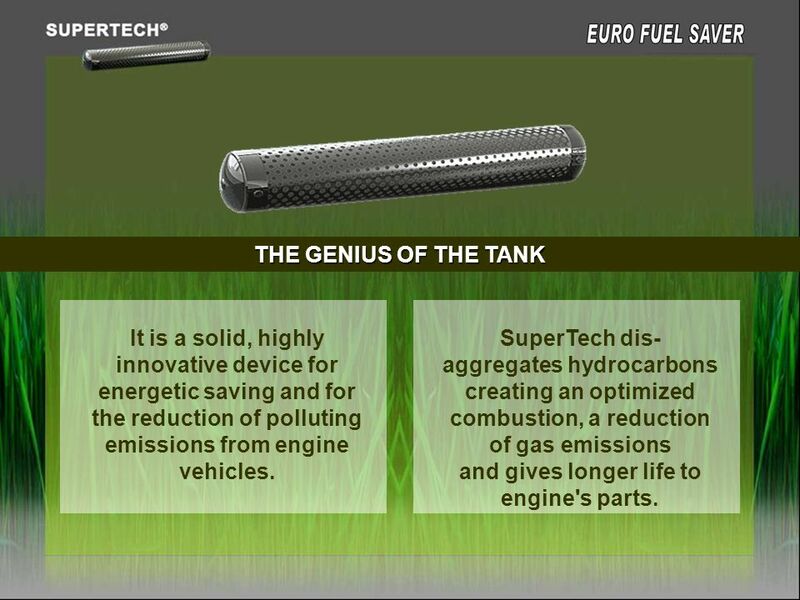 SuperTech dis-aggregates hydrocarbons creating an optimized combustion, a reduction of gas emissions and gives longer life to engine's parts. 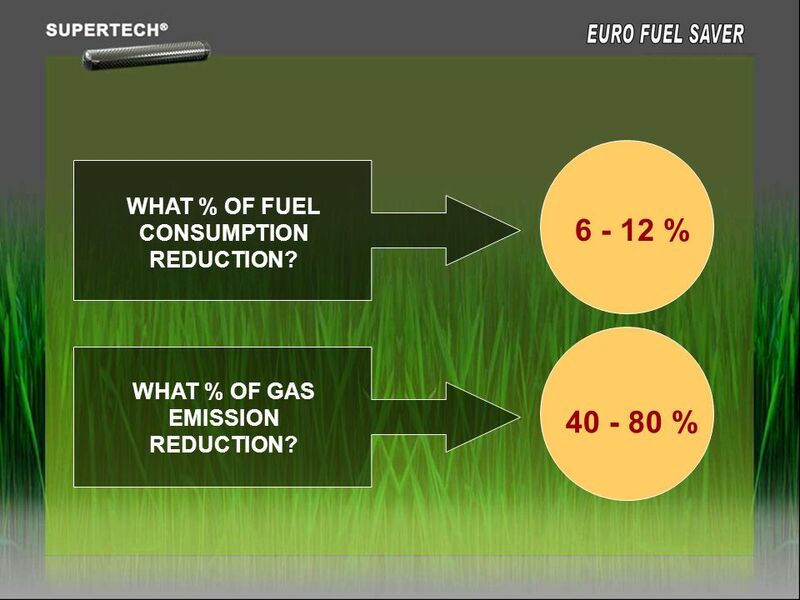 7 WHAT % OF FUEL CONSUMPTION REDUCTION? 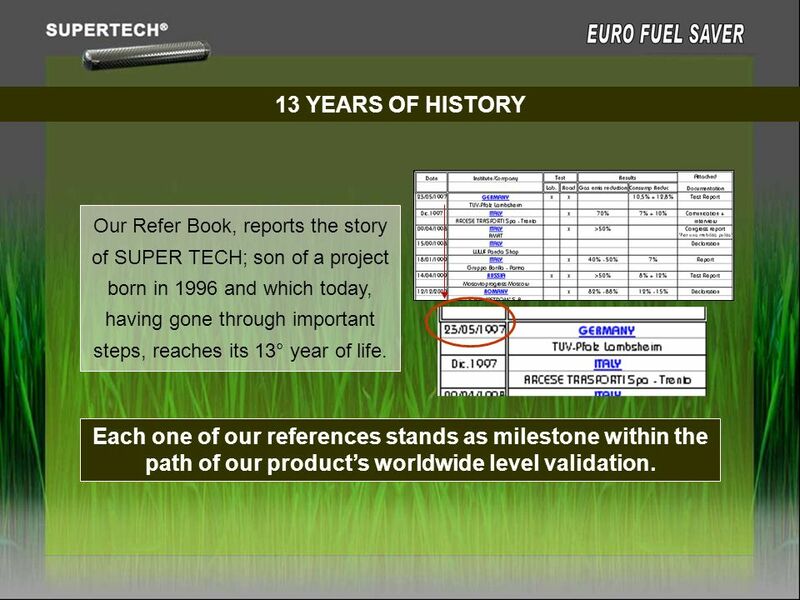 8 13 YEARS OF HISTORY Our Refer Book, reports the story of SUPER TECH; son of a project born in 1996 and which today, having gone through important steps, reaches its 13° year of life. 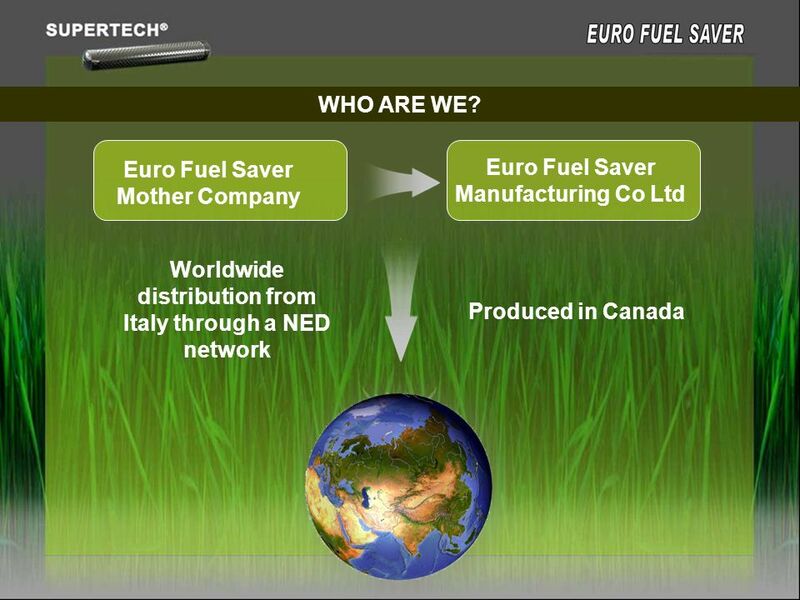 Each one of our references stands as milestone within the path of our product’s worldwide level validation. 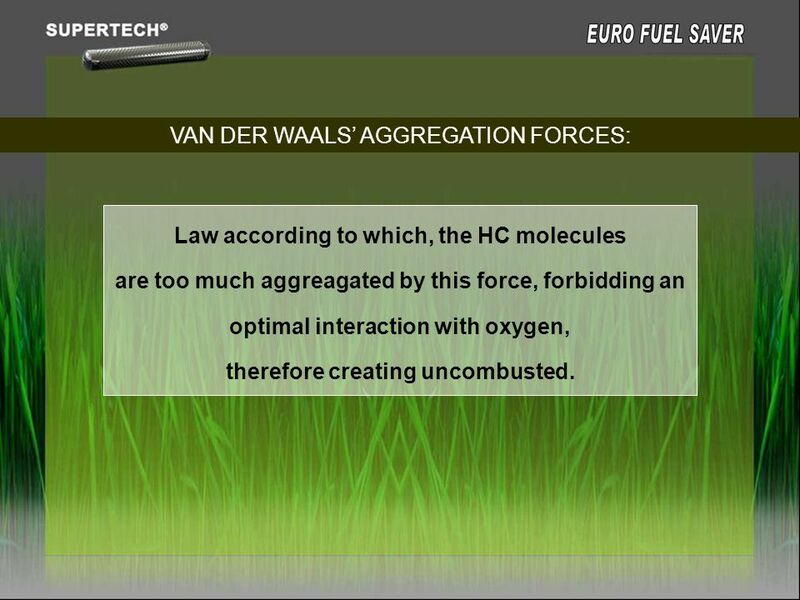 Law according to which, the HC molecules are too much aggreagated by this force, forbidding an optimal interaction with oxygen, therefore creating uncombusted. 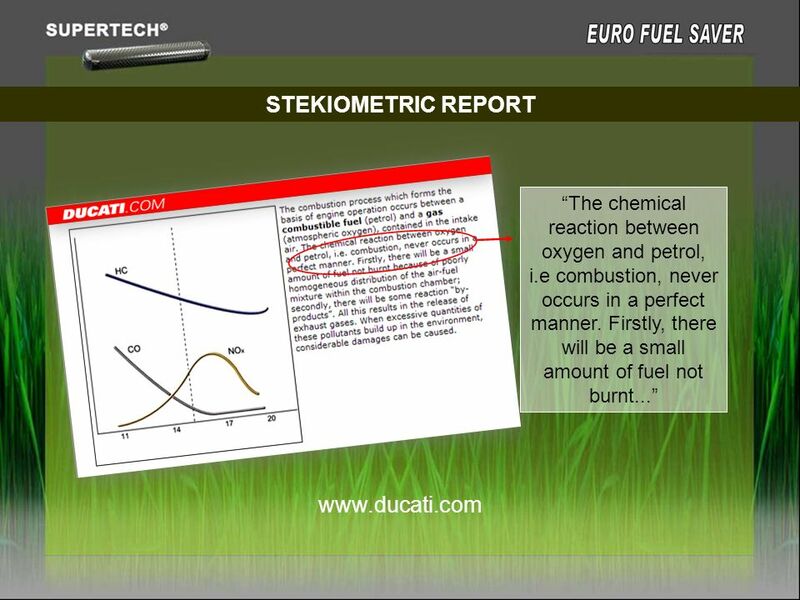 Stekiometric Report is the report, in exact weight for combustion, between air and fuel. It is necessary to have 14,7 kg. of air to burn 1kg. 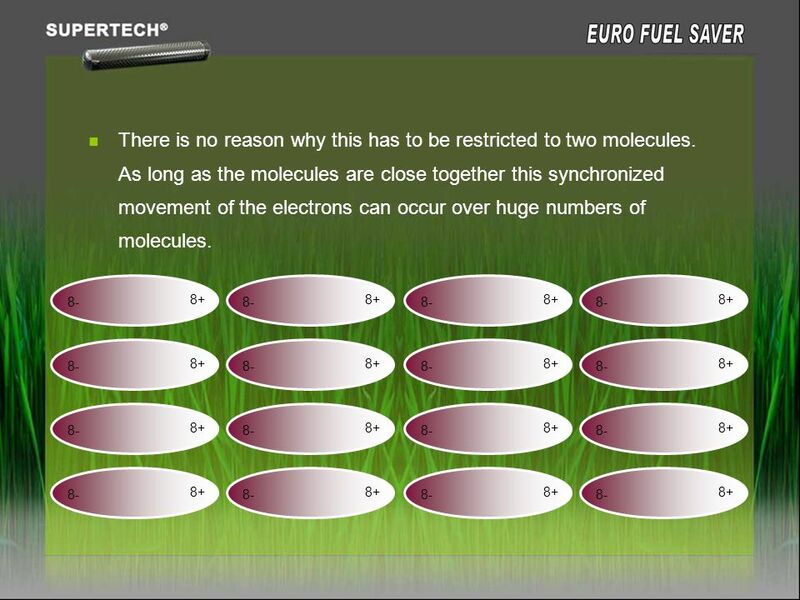 of fuel, and 14kg of air for 1kg of diesel; 34kg for one 1kg of hydrogen. 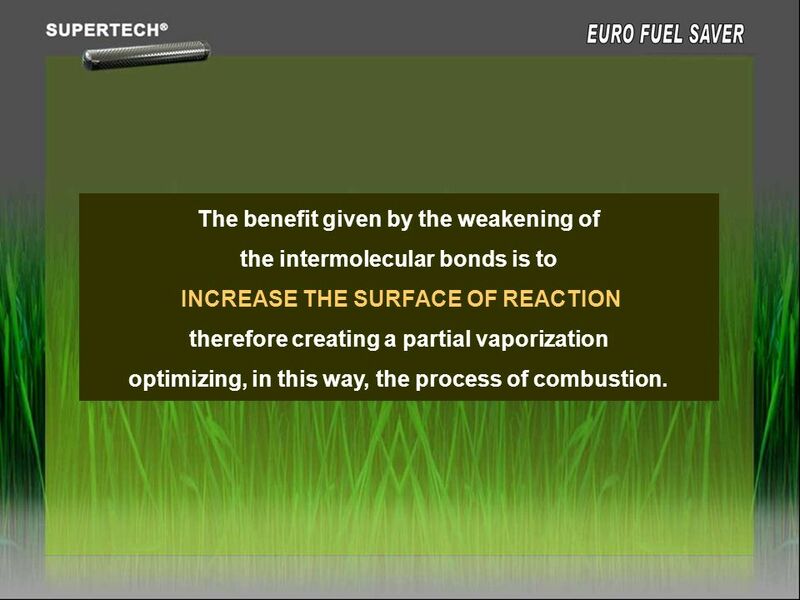 Fuel must have the capacity to prepare a mixture of homogeneous air-fuel, therefore it must have the capacity of vaporizing fuel through powderers and mixing the vaporized fuel with air creating an inflammable mixture. 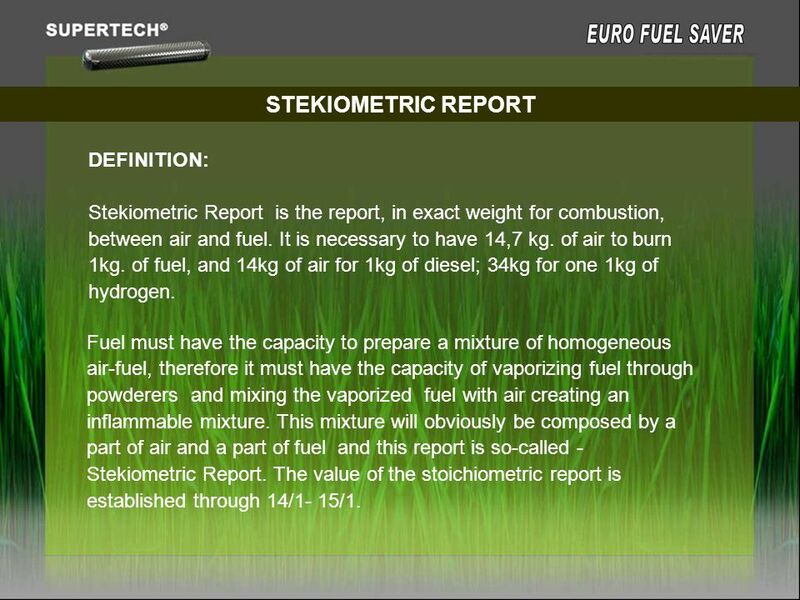 This mixture will obviously be composed by a part of air and a part of fuel and this report is so-called - Stekiometric Report. 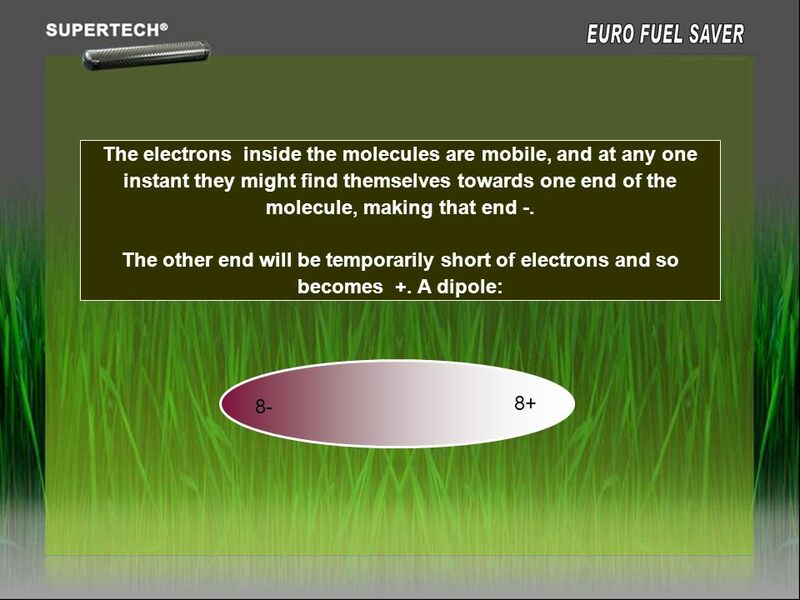 The value of the stoichiometric report is established through 14/1- 15/1. 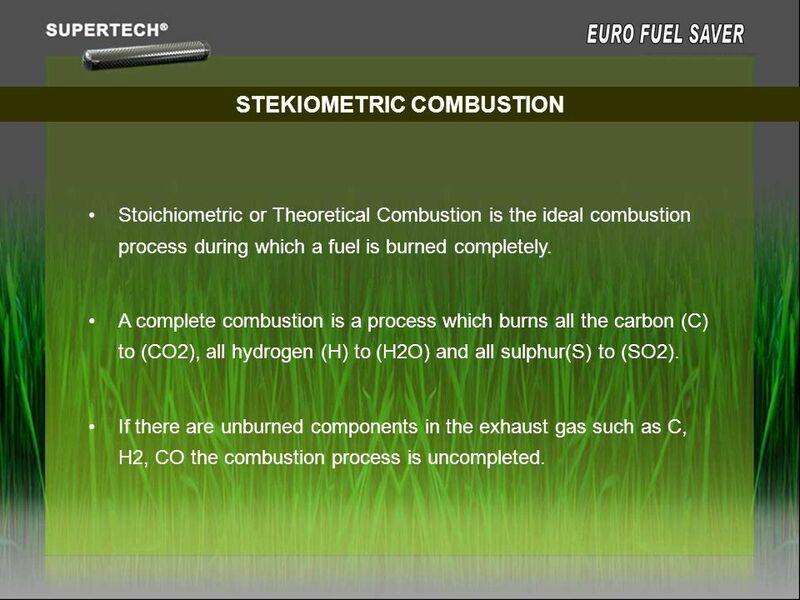 Stoichiometric or Theoretical Combustion is the ideal combustion process during which a fuel is burned completely. 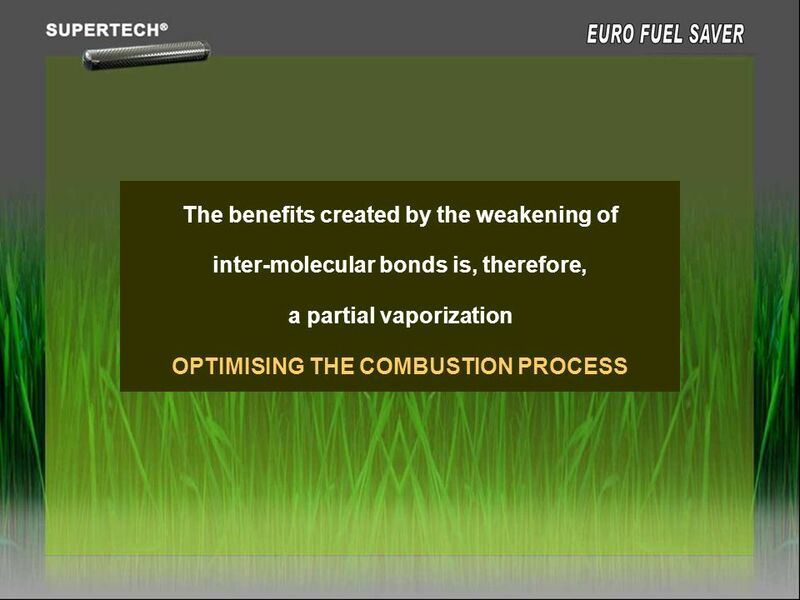 A complete combustion is a process which burns all the carbon (C) to (CO2), all hydrogen (H) to (H2O) and all sulphur(S) to (SO2). 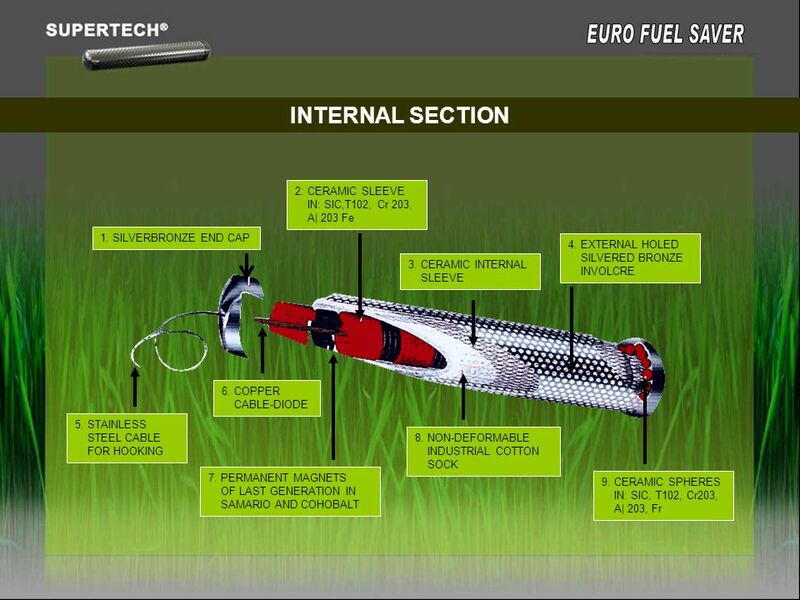 If there are unburned components in the exhaust gas such as C, H2, CO the combustion process is uncompleted. 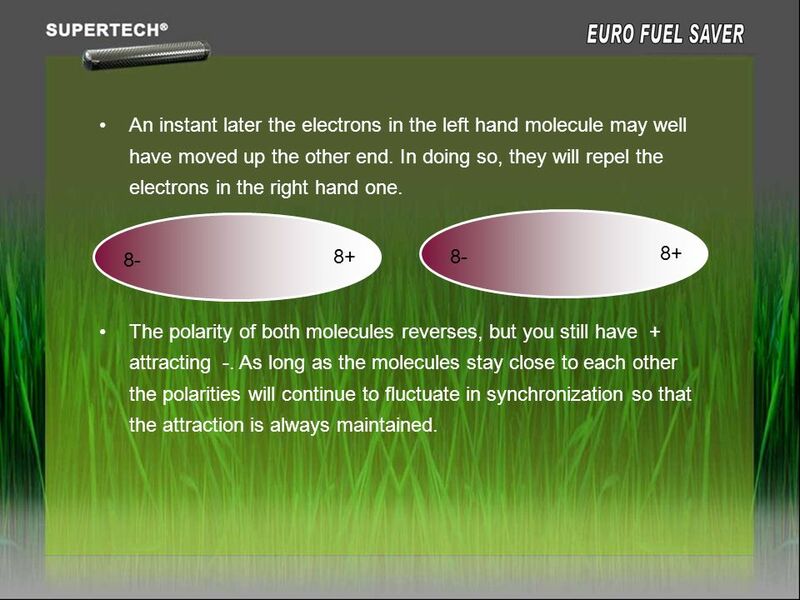 INTERMOLECULAR attractions are attractions between one molecule and a neighboring molecule. 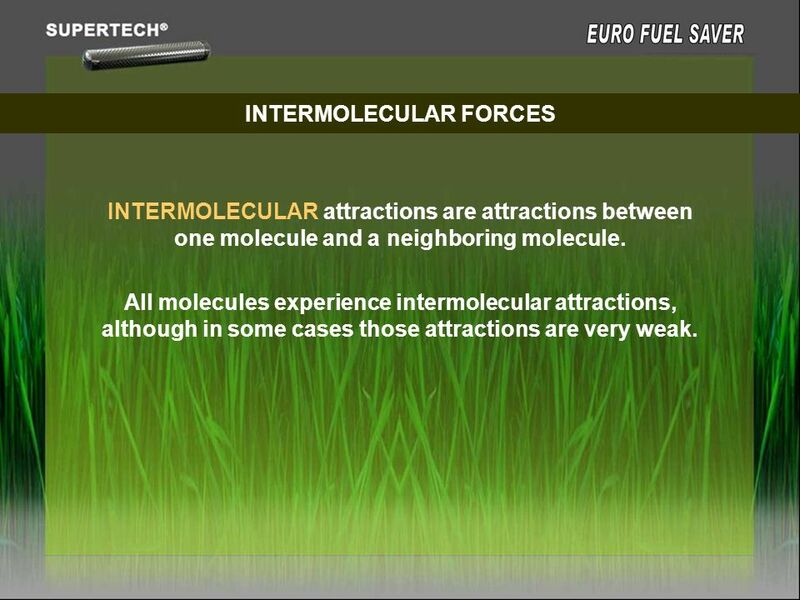 All molecules experience intermolecular attractions, although in some cases those attractions are very weak. 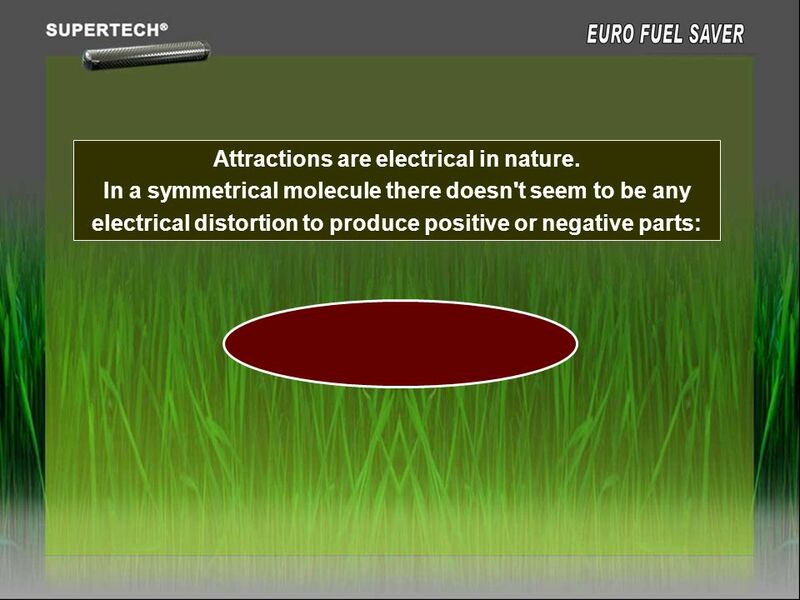 17 Attractions are electrical in nature. 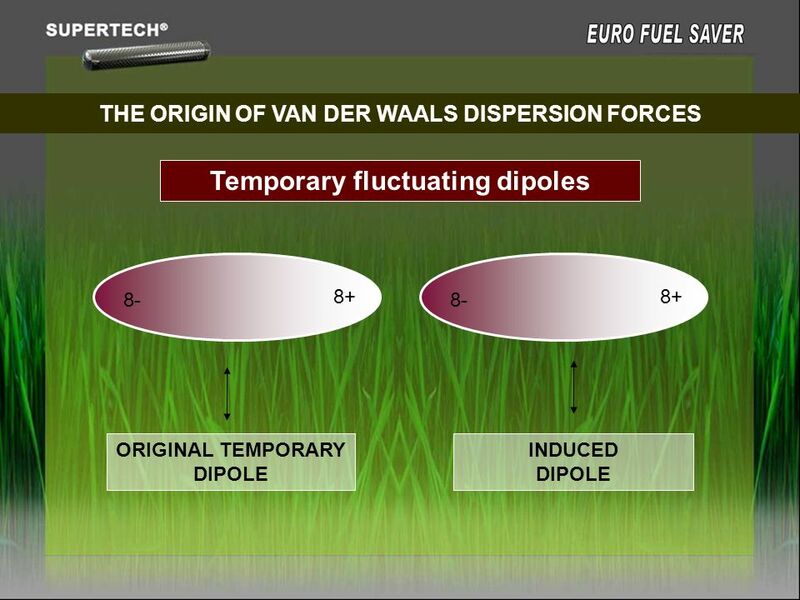 INCREASE THE SURFACE OF REACTION therefore creating a partial vaporization optimizing, in this way, the process of combustion. This means, they have signature and contact numbers of the people envolved in experimentations. Giving, therefore, the possibility to easily check the same. The next slides are but a few of our references. For review of ALL our many hundreds of references please check: The following are just a sample of our references. REFERENCE MINISTRY OF THE UNIVERSITY AND SCIENTIFIC AND TECHNOLOGICAL RESEARCH CONFERENCE “CAR FREE CITIES” 60 different European cities have taken part in this conference. 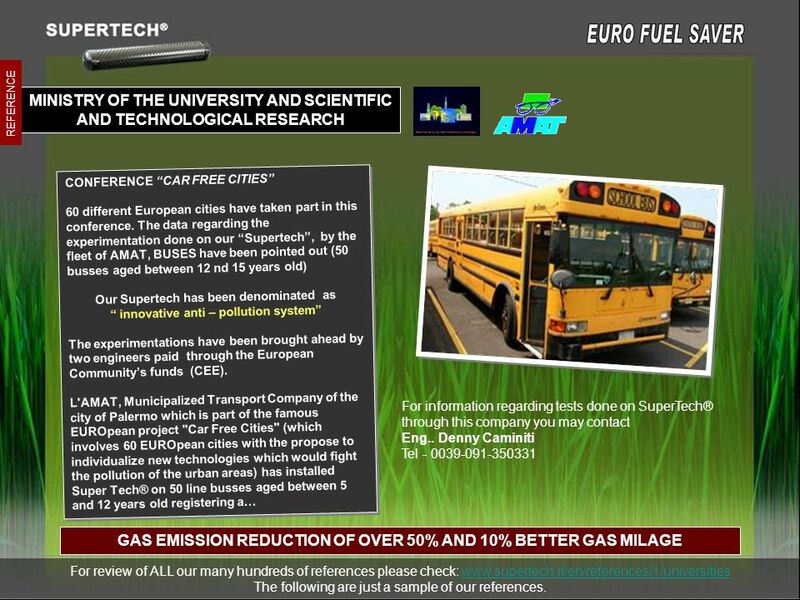 The data regarding the experimentation done on our “Supertech”, by the fleet of AMAT, BUSES have been pointed out (50 busses aged between 12 nd 15 years old) Our Supertech has been denominated as “ innovative anti – pollution system” The experimentations have been brought ahead by two engineers paid through the European Community’s funds (CEE). L'AMAT, Municipalized Transport Company of the city of Palermo which is part of the famous EUROpean project "Car Free Cities" (which involves 60 EUROpean cities with the propose to individualize new technologies which would fight the pollution of the urban areas) has installed Super Tech® on 50 line busses aged between 5 and 12 years old registering a… For information regarding tests done on SuperTech® through this company you may contact Eng.. Denny Caminiti Tel GAS EMISSION REDUCTION OF OVER 50% AND 10% BETTER GAS MILAGE For review of ALL our many hundreds of references please check: The following are just a sample of our references. REFERENCE MM IMPORT KFT. 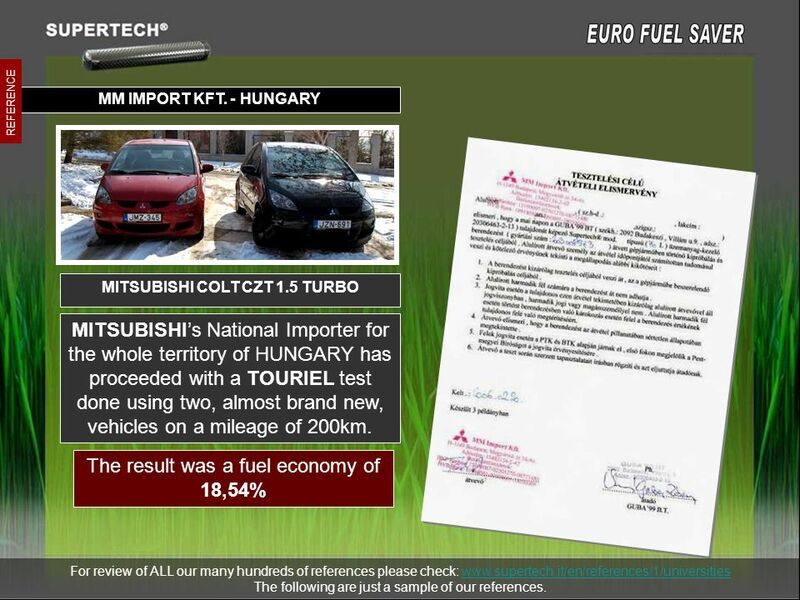 - HUNGARY MITSUBISHI COLT CZT 1.5 TURBO MITSUBISHI’s National Importer for the whole territory of HUNGARY has proceeded with a TOURIEL test done using two, almost brand new, vehicles on a mileage of 200km. 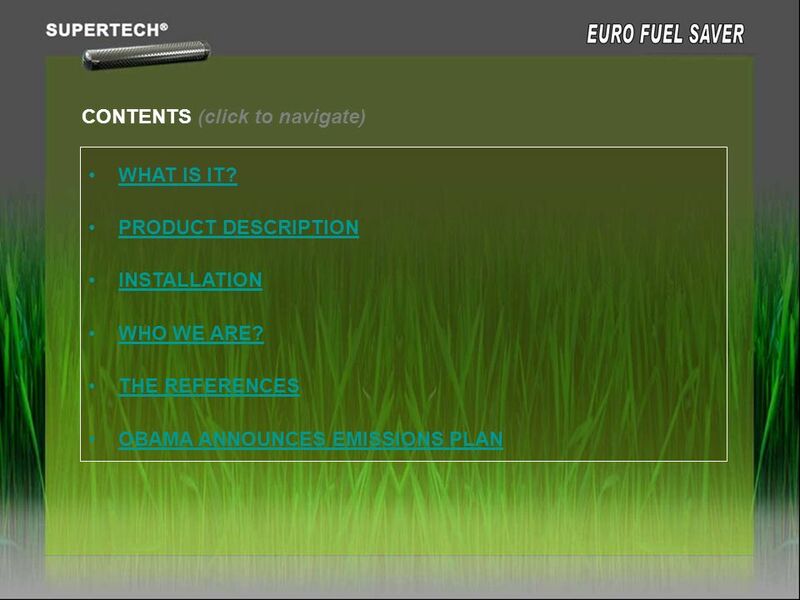 The result was a fuel economy of 18,54% For review of ALL our many hundreds of references please check: The following are just a sample of our references. MM IMPORT KFT. 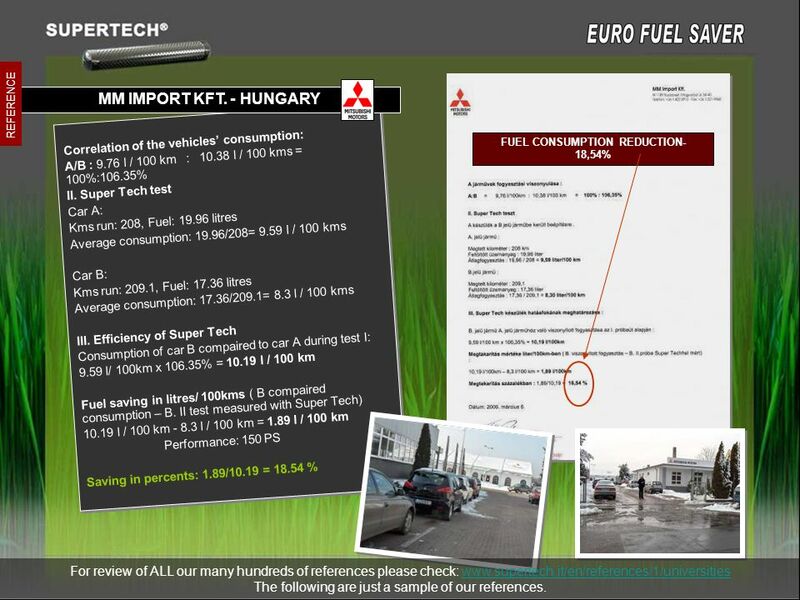 - HUNGARY REFERENCE Correlation of the vehicles’ consumption: A/B : 9.76 l / 100 km : l / 100 kms = 100%:106.35% II. 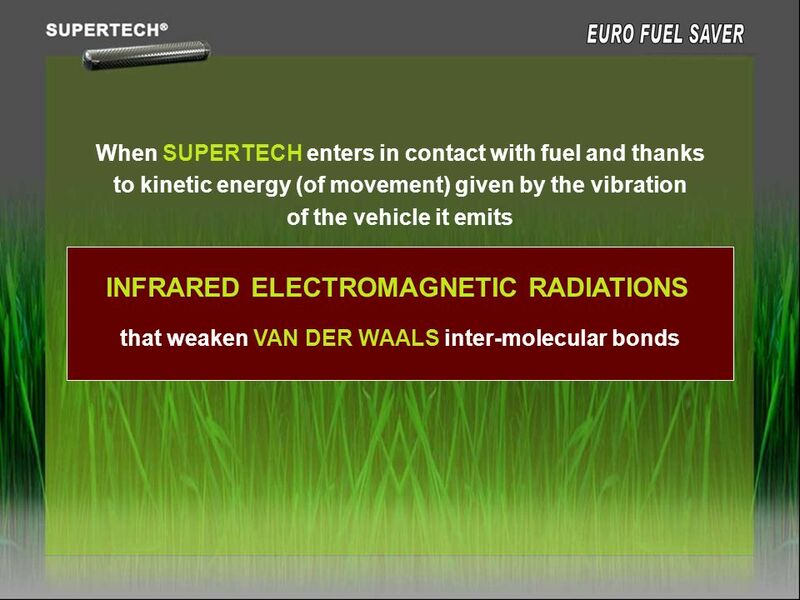 Super Tech test Car A: Kms run: 208, Fuel: litres Average consumption: 19.96/208= 9.59 l / 100 kms Car B: Kms run: 209.1, Fuel: litres Average consumption: 17.36/209.1= 8.3 l / 100 kms III. 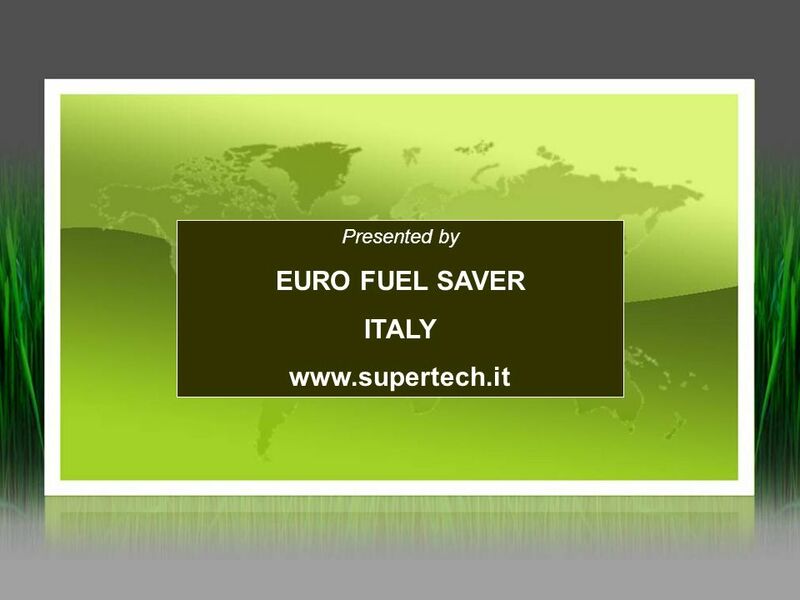 Efficiency of Super Tech Consumption of car B compaired to car A during test I: 9.59 l/ 100km x % = l / 100 km Fuel saving in litres/ 100kms ( B compaired consumption – B. II test measured with Super Tech) 10.19 l / 100 km l / 100 km = 1.89 l / 100 km Performance: 150 PS Saving in percents: 1.89/10.19 = % FUEL CONSUMPTION REDUCTION-18,54% For review of ALL our many hundreds of references please check: The following are just a sample of our references. 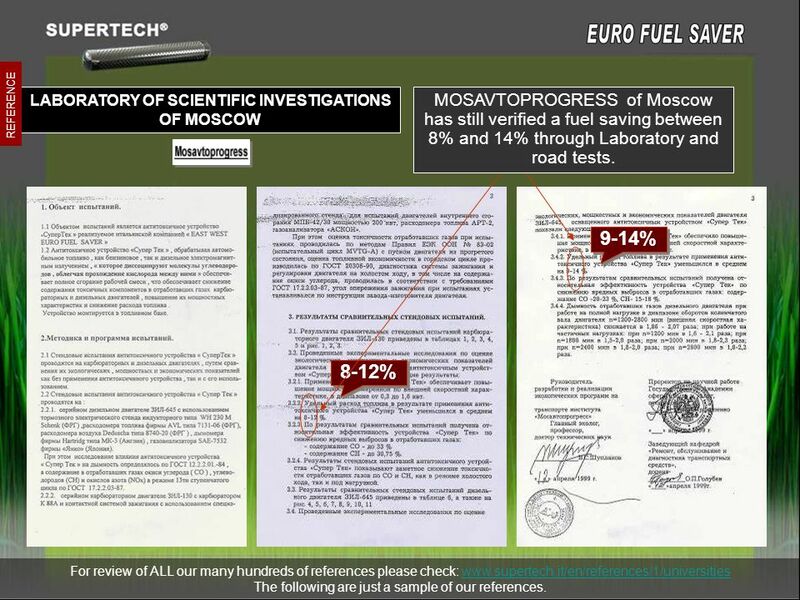 MOSAVTOPROGRESS of Moscow has still verified a fuel saving between 8% and 14% through Laboratory and road tests. 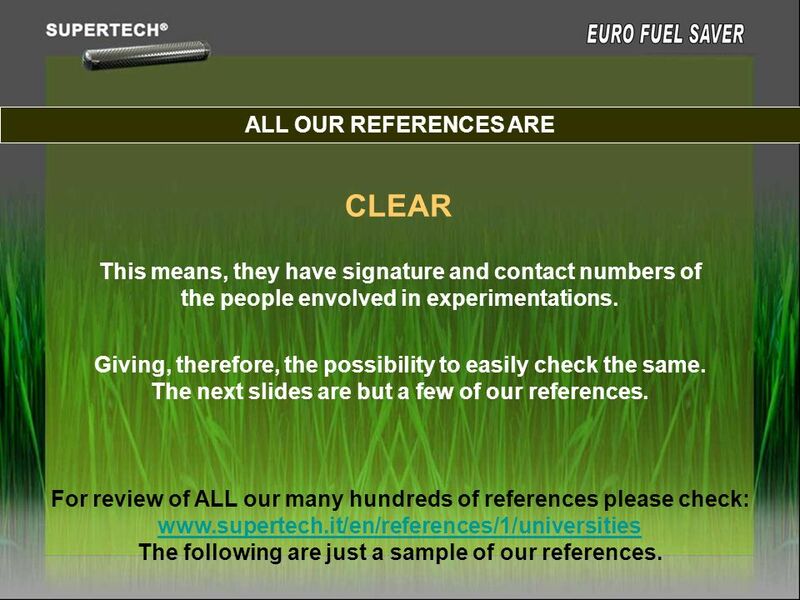 REFERENCE 9-14% 8-12% For review of ALL our many hundreds of references please check: The following are just a sample of our references. REFERENCE LABORATORY OF SCIENTIFIC INVESTIGATIONS OF MOSCOW At the end of the tests a visual check of pistons, cylinder heads and engine valves estate of the referred vehicles was made, looking to the surface through the sparking plug hole. 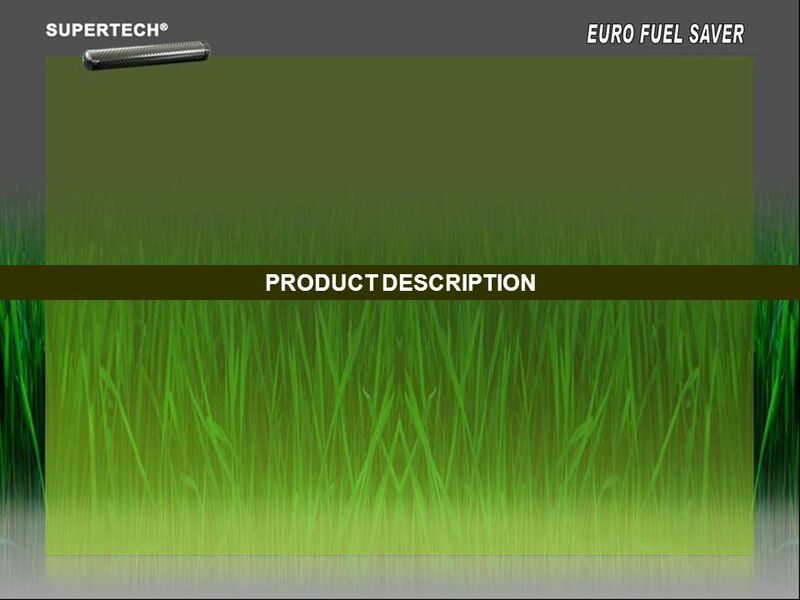 The check confirmed a complete absence of soot in the inner surface of the engine as well as in the sparking plug. 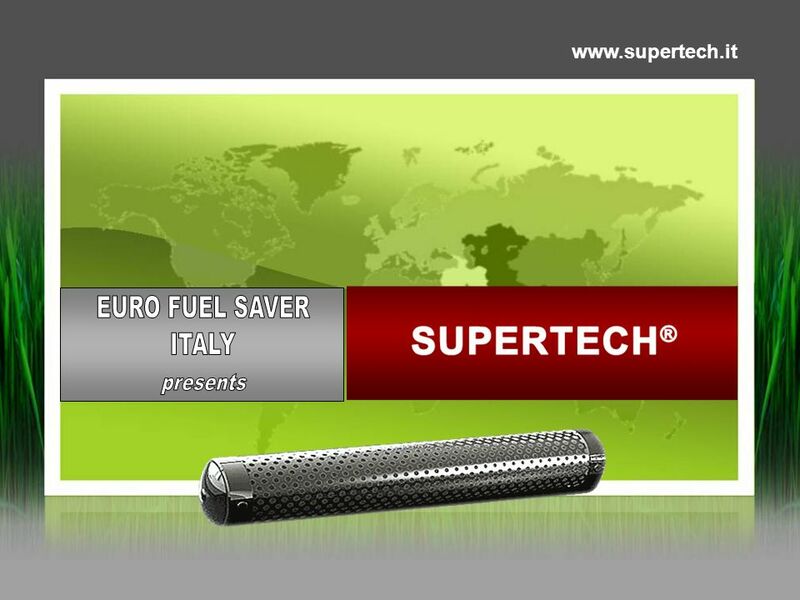 “CHIMNEY SWEEPER EFFECT” BEFORE THE USE OF SUPERTECH® AFTER THE USE OF SUPERTECH® For review of ALL our many hundreds of references please check: The following are just a sample of our references. 37 The following are just a sample of our references. 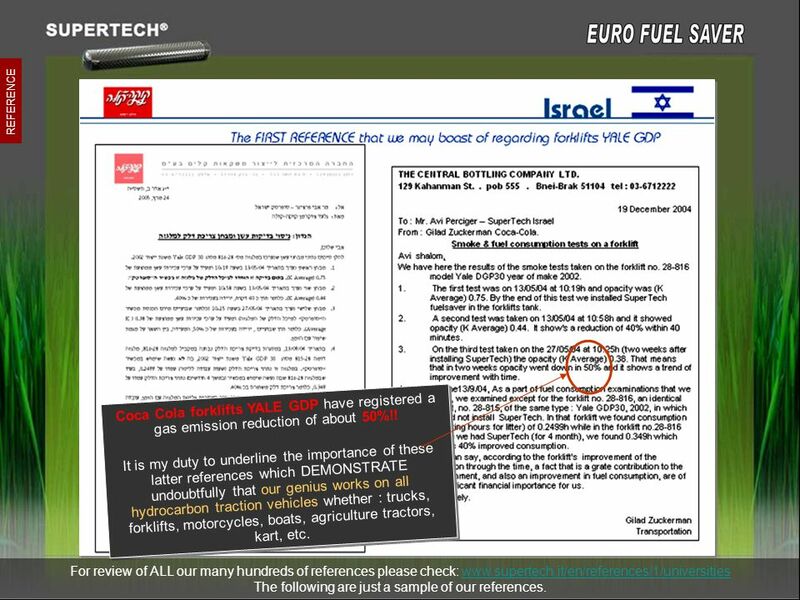 Coca Cola forklifts YALE GDP have registered a gas emission reduction of about 50%!! 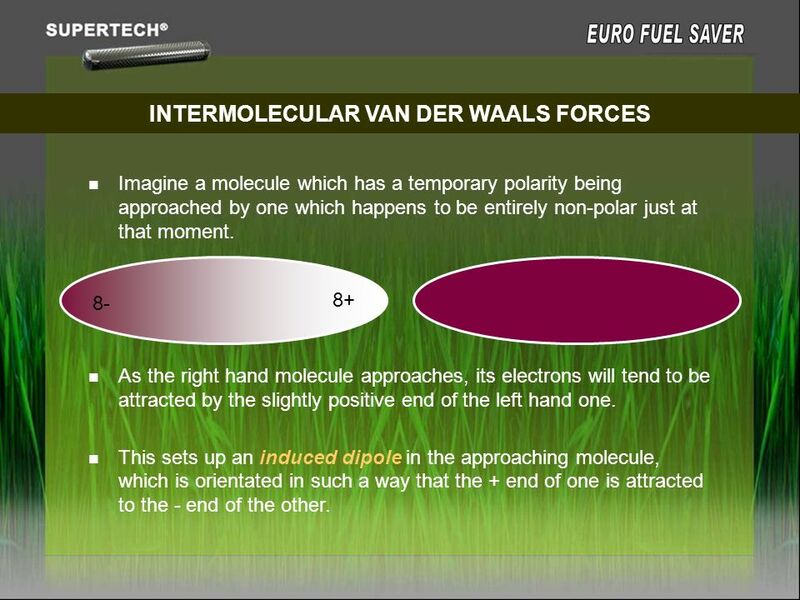 It is my duty to underline the importance of these latter references which DEMONSTRATE undoubtfully that our genius works on all hydrocarbon traction vehicles whether : trucks, forklifts, motorcycles, boats, agriculture tractors, kart, etc. For review of ALL our many hundreds of references please check: The following are just a sample of our references. REFERENCE For review of ALL our many hundreds of references please check: The following are just a sample of our references. 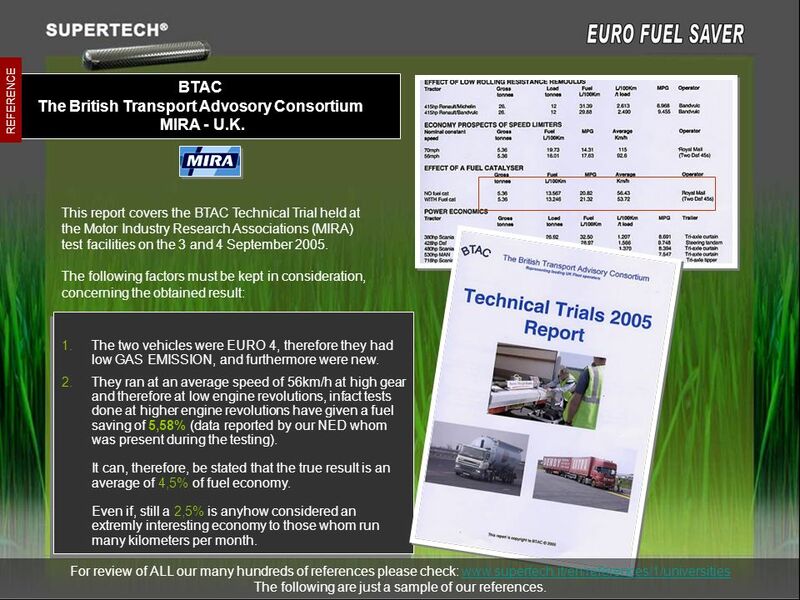 MIRA - U.K. REFERENCE This report covers the BTAC Technical Trial held at the Motor Industry Research Associations (MIRA) test facilities on the 3 and 4 September 2005. 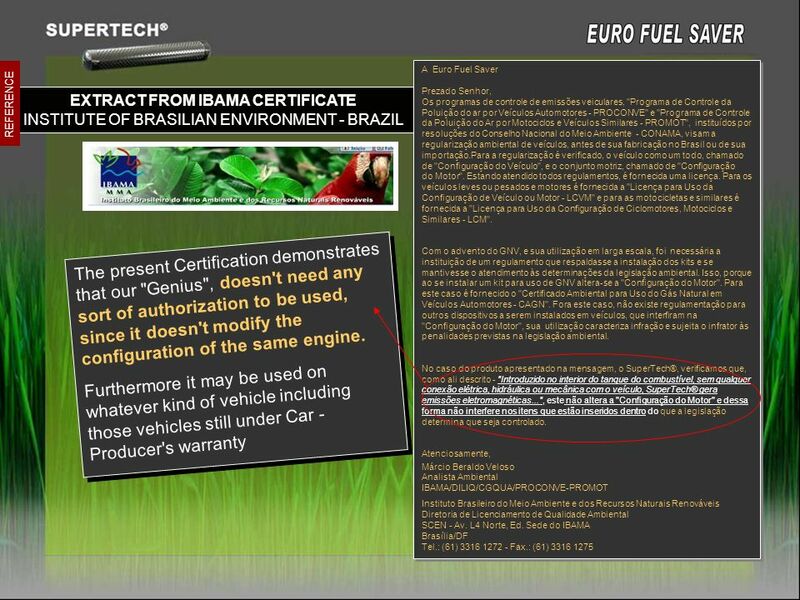 The following factors must be kept in consideration, concerning the obtained result: The two vehicles were EURO 4, therefore they had low GAS EMISSION, and furthermore were new. They ran at an average speed of 56km/h at high gear and therefore at low engine revolutions, infact tests done at higher engine revolutions have given a fuel saving of 5,58% (data reported by our NED whom was present during the testing). 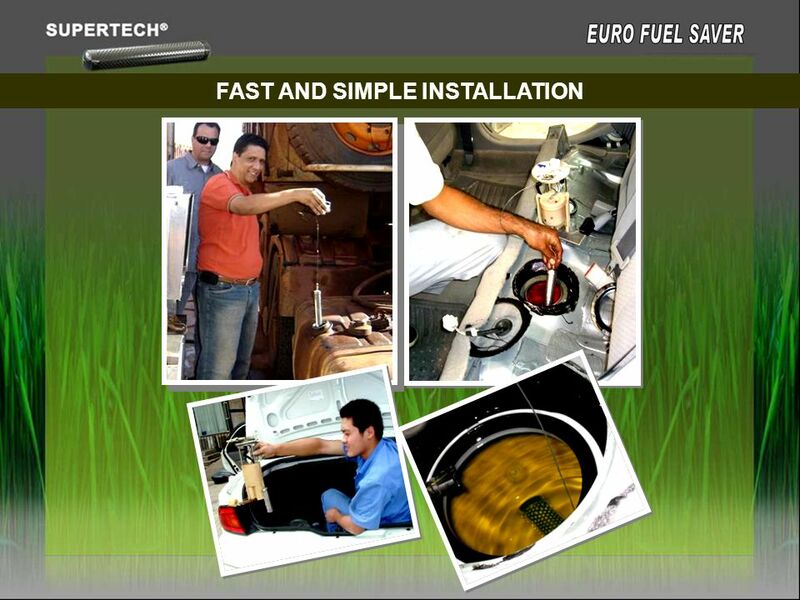 It can, therefore, be stated that the true result is an average of 4,5% of fuel economy. Even if, still a 2,5% is anyhow considered an extremly interesting economy to those whom run many kilometers per month. For review of ALL our many hundreds of references please check: The following are just a sample of our references. 40 The following are just a sample of our references. 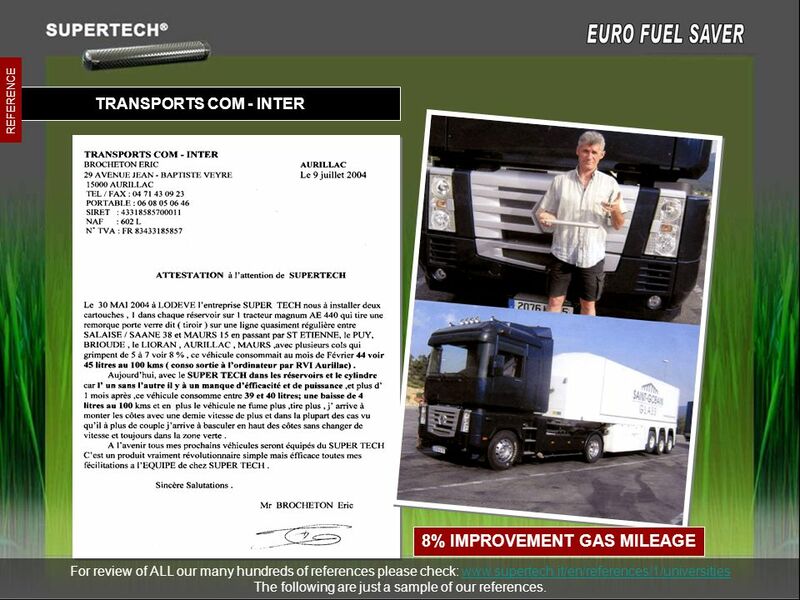 TRANSPORTS COM - INTER 8% IMPROVEMENT GAS MILEAGE For review of ALL our many hundreds of references please check: The following are just a sample of our references. 41 The following are just a sample of our references. 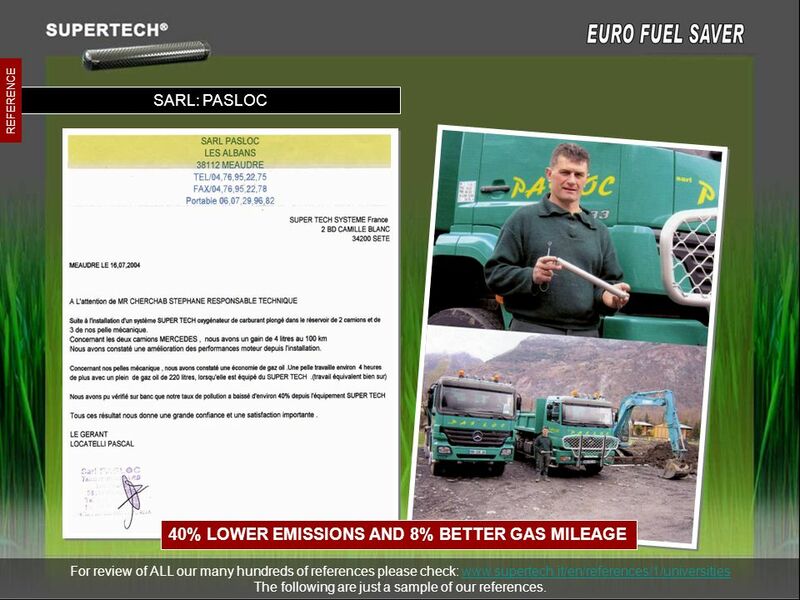 SARL: PASLOC 40% LOWER EMISSIONS AND 8% BETTER GAS MILEAGE For review of ALL our many hundreds of references please check: The following are just a sample of our references. 42 The following are just a sample of our references. 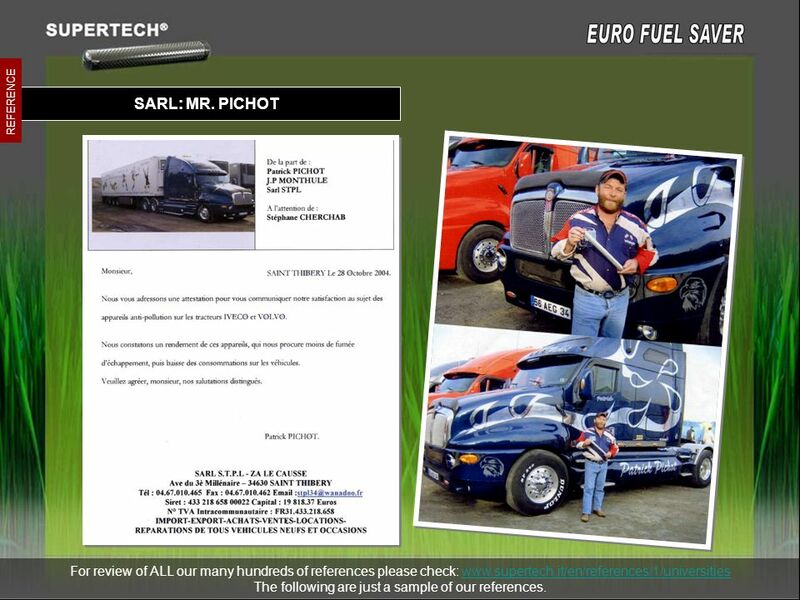 SARL: MR. PICHOT For review of ALL our many hundreds of references please check: The following are just a sample of our references. 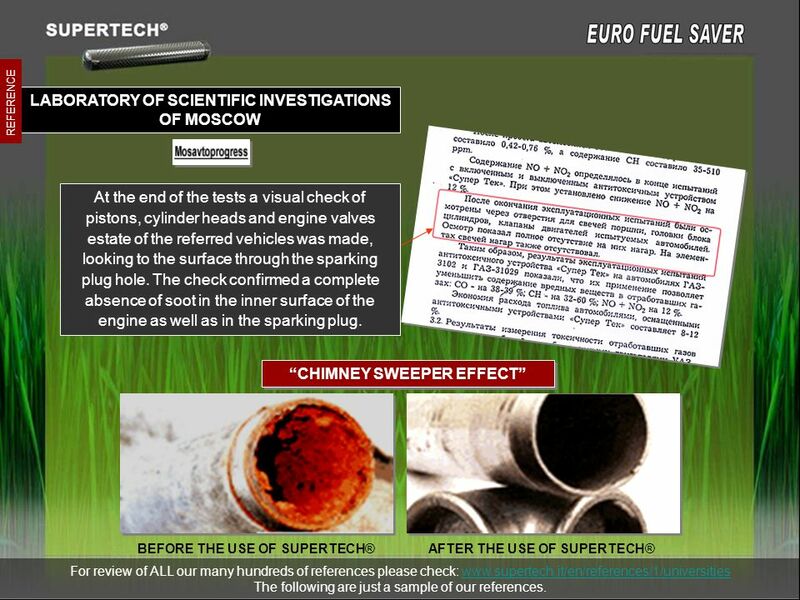 REFERENCE CONCLUSION OF EXPERIMENTS WITH EQUIPMENT OF SUPER TECH Subscriber of experiments: “V-Auto LV Ltd., Legal address Saules , Ventspils, LV-3601 Objective of experiments: Prescribe influence of Super Tech equipment diesel engine for fuel consumption. 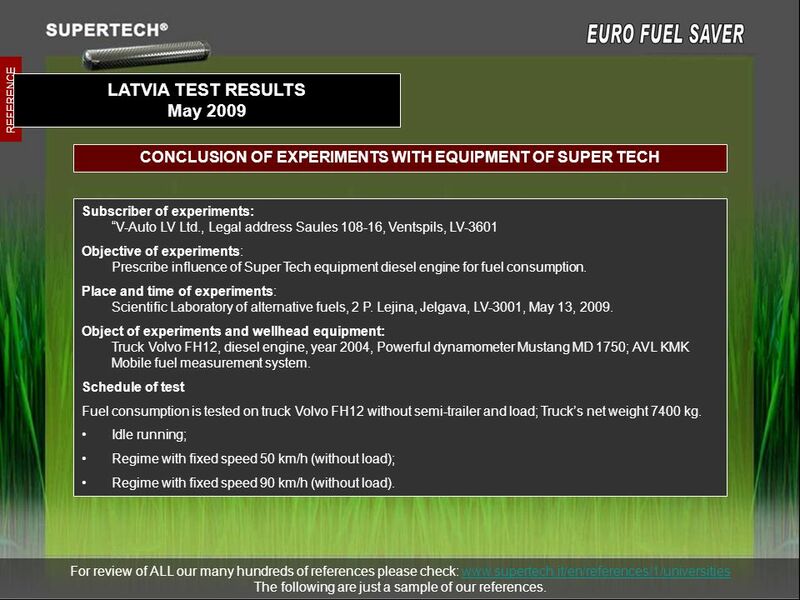 Place and time of experiments: Scientific Laboratory of alternative fuels, 2 P. Lejina, Jelgava, LV-3001, May 13, 2009. 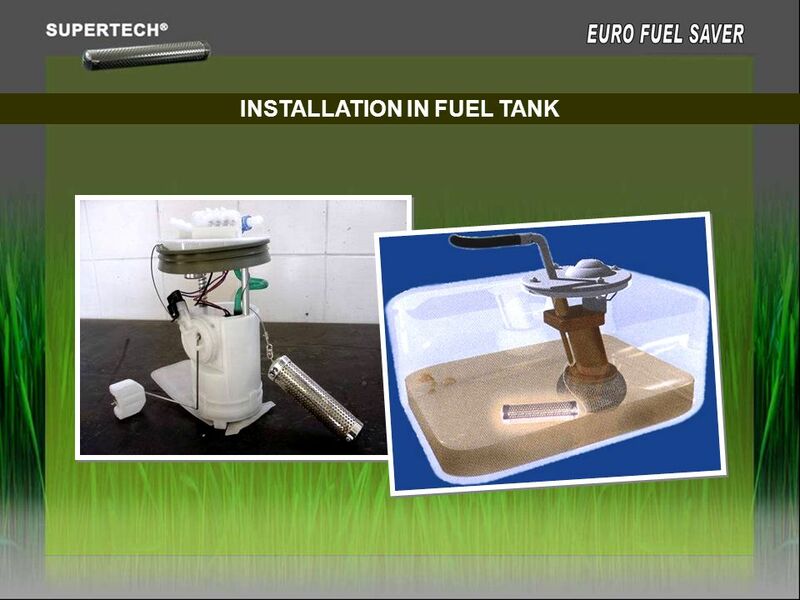 Object of experiments and wellhead equipment: Truck Volvo FH12, diesel engine, year 2004, Powerful dynamometer Mustang MD 1750; AVL KMK Mobile fuel measurement system. 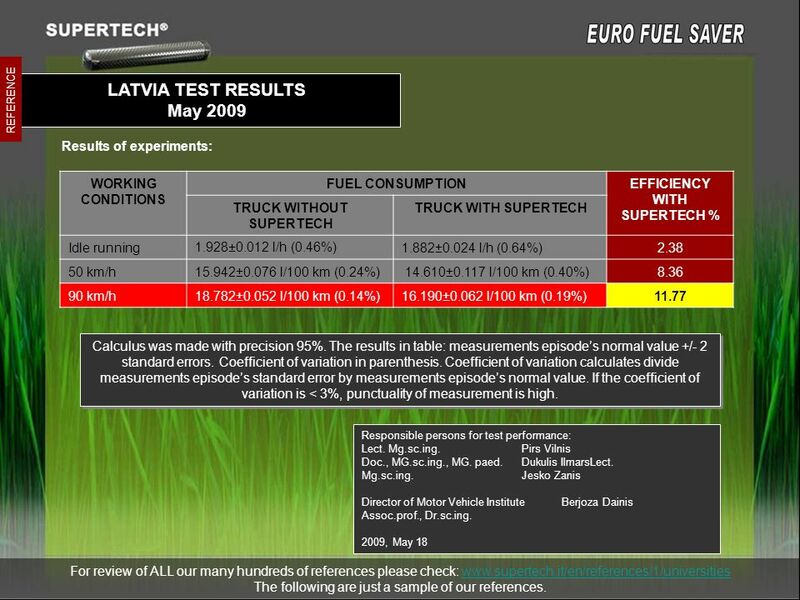 Schedule of test Fuel consumption is tested on truck Volvo FH12 without semi-trailer and load; Truck’s net weight 7400 kg. 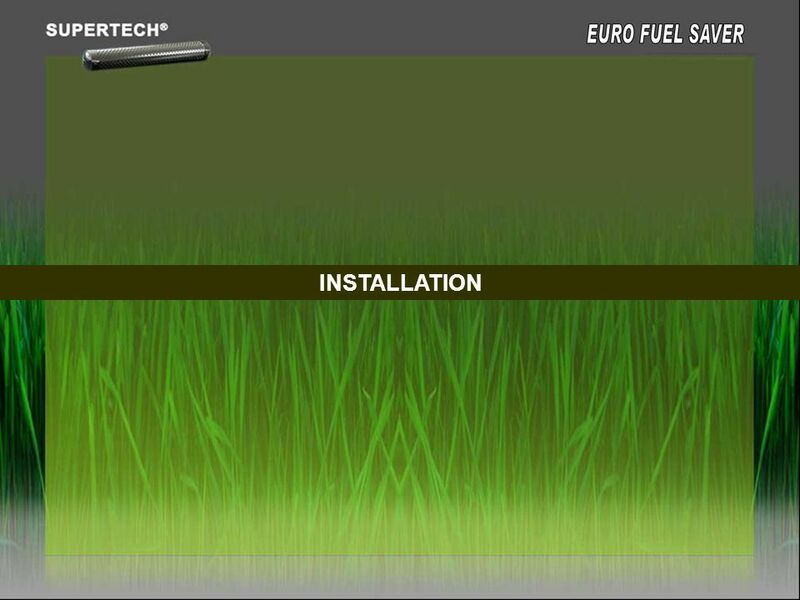 Idle running; Regime with fixed speed 50 km/h (without load); Regime with fixed speed 90 km/h (without load). For review of ALL our many hundreds of references please check: The following are just a sample of our references. 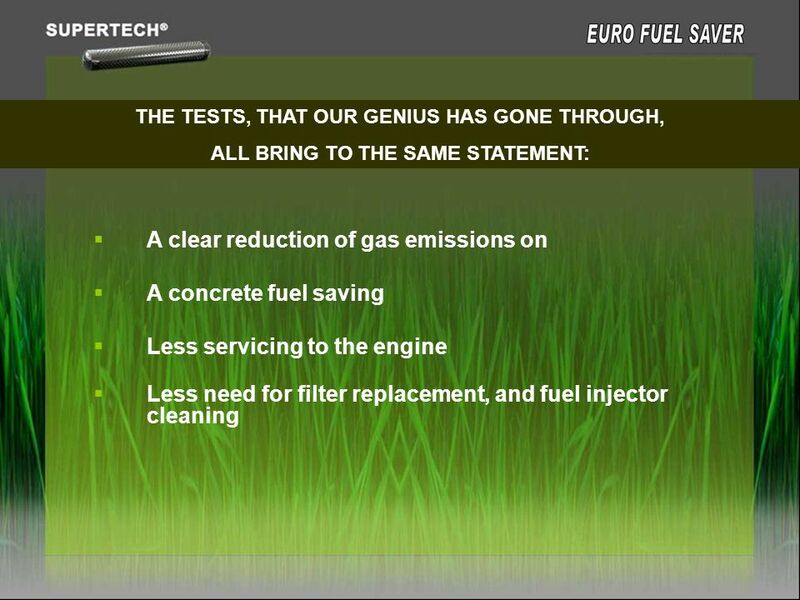 REFERENCE Results of experiments: WORKING CONDITIONS FUEL CONSUMPTION EFFICIENCY WITH SUPERTECH % TRUCK WITHOUT SUPERTECH TRUCK WITH SUPERTECH Idle running 1.928±0.012 l/h (0.46%) 1.882±0.024 l/h (0.64%) 2.38 50 km/h 15.942±0.076 l/100 km (0.24%) 14.610±0.117 l/100 km (0.40%) 8.36 90 km/h 18.782±0.052 l/100 km (0.14%) 16.190±0.062 l/100 km (0.19%) 11.77 Calculus was made with precision 95%. The results in table: measurements episode’s normal value +/- 2 standard errors. Coefficient of variation in parenthesis. Coefficient of variation calculates divide measurements episode’s standard error by measurements episode’s normal value. If the coefficient of variation is < 3%, punctuality of measurement is high. Responsible persons for test performance: Lect. Mg.sc.ing. Pirs Vilnis Doc., MG.sc.ing., MG. paed. Dukulis IlmarsLect. Mg.sc.ing Jesko Zanis Director of Motor Vehicle Institute Berjoza Dainis Assoc.prof., Dr.sc.ing. 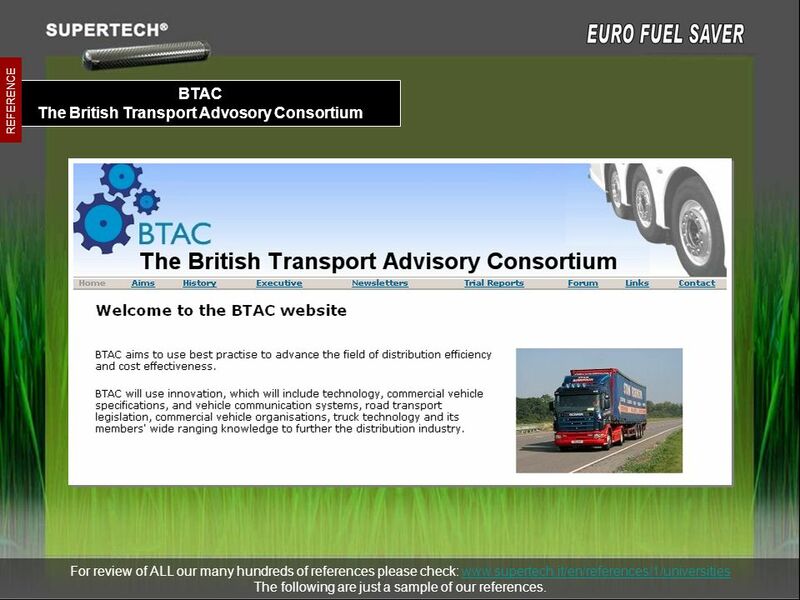 2009, May 18 For review of ALL our many hundreds of references please check: The following are just a sample of our references. 45 WHAT % OF FUEL CONSUMPTION REDUCTION? 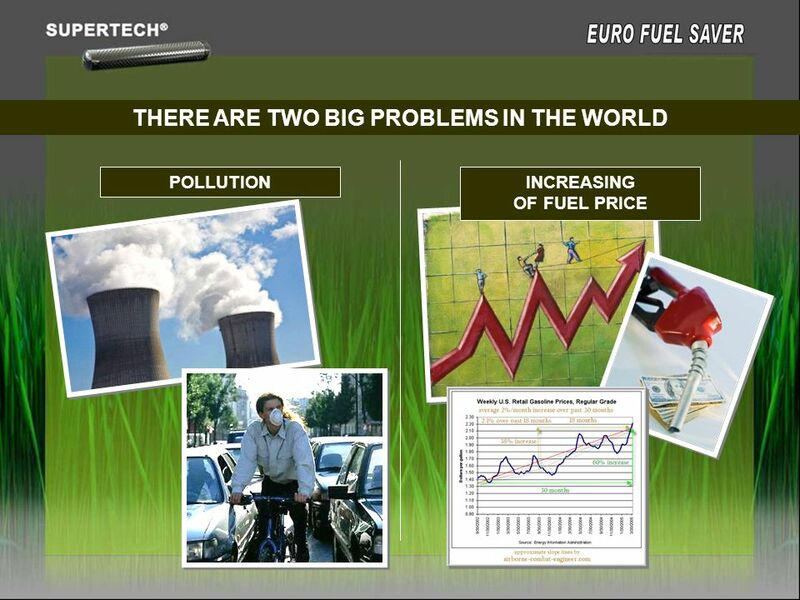 Carregar ppt "EURO FUEL SAVER ITALY presents"
Part 5: Regression Algebra and Fit 5-1/34 Econometrics I Professor William Greene Stern School of Business Department of Economics.